Josquin des Prez (French: [ʒɔskɛ̃ depʁe]; c. 1450/1455 – 27 August 1521), often referred to simply as Josquin, was a French composer of the Renaissance. His original name is sometimes given as Josquin Lebloitte and his later name is given under a wide variety of spellings in French, Italian, and Latin, including Iosquinus Pratensis and Iodocus a Prato. His motet Illibata Dei virgo nutrix includes an acrostic of his name, where he spelled it "Josquin des Prez". He was the most famous European composer between Guillaume Dufay and Giovanni Pierluigi da Palestrina, and is usually considered to be the central figure of the Franco-Flemish School. Josquin is widely considered by music scholars to be the first master of the high Renaissance style of polyphonic vocal music that was emerging during his lifetime. During the 16th century, Josquin gradually acquired the reputation as the greatest composer of the age, his mastery of technique and expression universally imitated and admired. Writers as diverse as Baldassare Castiglione and Martin Luther wrote about his reputation and fame; theorists such as Heinrich Glarean and Gioseffo Zarlino held his style as that best representing perfection. He was so admired that many anonymous compositions were attributed to him by copyists, probably to increase their sales. More than 370 works are attributed to him; it was only after the advent of modern analytical scholarship that some of these attributions were challenged, and revealed as mistaken, on the basis of stylistic features and manuscript evidence. Yet in spite of Josquin's colossal reputation, which endured until the beginning of the Baroque era and was revived in the 20th century, his biography is shadowy, and virtually nothing is known about his personality. The only surviving work which may be in his own hand is a graffito on the wall of the Sistine Chapel, and only one contemporary mention of his character is known, in a letter to Duke Ercole I of Ferrara. The lives of dozens of less revered Renaissance composers are better documented than that of Josquin. Little is known for certain of Josquin's early life. Much is inferential and speculative, though numerous clues have emerged from his works and the writings of contemporary composers, theorists, and writers of the next several generations. Josquin was born in the area controlled by the Dukes of Burgundy, and was possibly born either in Hainaut (modern-day Belgium), or immediately across the border in modern-day France, since several times in his life he was classified legally as a Frenchman (for instance, when he made his will). Josquin was long mistaken for a man with a similar name, Josquin de Kessalia, born around the year 1440, who sang in Milan from 1459 to 1474, dying in 1498. More recent scholarship has shown that Josquin des Prez was born around 1450 or a few years later, and did not go to Italy until the early 1480s. Around 1466, perhaps on the death of his father, Josquin was named by his uncle and aunt, Gille Lebloitte dit Desprez and Jacque Banestonne, as their heir. Their will gives Josquin's actual surname as Lebloitte. According to Matthews and Merkley, "des Prez" was an alternative name. According to an account by Claude Hémeré, a friend and librarian of Cardinal Richelieu whose evidence dates as late as 1633, and who used the records of the collegiate church of Saint-Quentin, Josquin became a choirboy with his friend and colleague the Franco Flemish composer Jean Mouton at Saint-Quentin's royal church, probably around 1460. Doubt has been cast on the accuracy of Hémeré's account, however. Josquin may have studied counterpoint under Ockeghem, whom he greatly admired throughout his life: this is suggested both by the testimony of Gioseffo Zarlino and Lodovico Zacconi, writing later in the 16th century, and by Josquin's eloquent lament on the death of Ockeghem in 1497, Nymphes des bois/Requiem aeternam, based on the poem by Jean Molinet. All records from Saint-Quentin were destroyed in 1669; however the collegiate chapel there was a center of music-making for the entire area, and in addition was an important center of royal patronage. Both Jean Mouton and Loyset Compère were buried there and it is certainly possible that Josquin acquired his later connections with the French royal chapel through early experiences at Saint-Quentin. The first definite record of his employment is dated 19 April 1477, and it shows that he was a singer at the chapel of René, Duke of Anjou, in Aix-en-Provence. He remained there at least until 1478. No certain records of his movements exist for the period from March 1478 until 1483, but if he remained in the employ of René he would have transferred to Paris in 1481 along with the rest of the chapel. One of Josquin's early motets, Misericordias Domini in aeternum cantabo, suggests a direct connection with Louis XI, who was king during this time. In 1483 Josquin returned to Condé to claim his inheritance from his aunt and uncle, who may have been killed by the army of Louis XI in May 1478, when they besieged the town, locked the population into the church, and burned them alive. The period from 1480 to 1482 has puzzled biographers; contradictory evidence exists suggesting either that Josquin was still in France, or was already in the service of the Sforza family, specifically with Ascanio Sforza, who had been banished from Milan and resided temporarily in Ferrara or Naples. Residence in Ferrara in the early 1480s could explain the Missa Hercules dux Ferrariae, composed for Ercole d'Este, but which stylistically does not fit with the usual date of 1503–04 when Josquin was known to be in Ferrara. Alternatively it has been suggested that Josquin spent some of that time in Hungary, based on a mid-16th-century Roman document describing the Hungarian court in those years, and including Josquin as one of the musicians present. In either 1483 or 1484, Josquin is known to have been in the service of the Sforza family in Milan. While in their employ, he made one or more trips to Rome, and possibly also to Paris; while in Milan he made the acquaintance of Franchinus Gaffurius, who was maestro di cappella of the cathedral there. He was in Milan again in 1489, after a possible period of travel; but he left that year. From 1489 to 1495, Josquin was a member of the papal choir, first under Pope Innocent VIII, and later under the Borgia pope Alexander VI. He may have gone there as part of a singer exchange with Gaspar van Weerbeke, who went back to Milan at the same time. While there, he may have been the one who carved his name into the wall of the Sistine Chapel; a "JOSQUINJ" was recently revealed by workers restoring the chapel. Since it was traditional for singers to carve their names into the walls, and hundreds of names were inscribed there during the period from the 15th to the 18th centuries, it is considered highly likely that the graffiti is by Josquin—and if so, it would be his only surviving autograph. Josquin's mature style evolved during this period; as in Milan he had absorbed the influence of light Italian secular music, in Rome he refined his techniques of sacred music. Several of his motets have been dated to the years he spent at the papal chapel. Around 1498, Josquin most likely re-entered the service of the Sforza family, on the evidence of a pair of letters between the Gonzaga and Sforza families. He probably did not stay in Milan long, for in 1499 Louis XII captured Milan in his invasion of northern Italy and imprisoned Josquin's former employers. Around this time Josquin most likely returned to France, although documented details of his career around the turn of the 16th century are lacking. Prior to departing Italy, he most likely wrote one of his most famous secular compositions, the frottola El grillo (the Cricket), as well as In te Domine speravi ("I have placed my hope in you, Lord"), based on Psalm 30. The latter composition may have been a veiled reference to the religious reformer Girolamo Savonarola, who had been burned at the stake in Florence in 1498, and for whom Josquin seems to have had a special reverence; the text was the Dominican friar's favorite psalm, a meditation on which he left incomplete in prison prior to his execution. Some of Josquin's compositions, such as the instrumental Vive le roy, have been tentatively dated to the period around 1500 when he was in France. A motet, Memor esto verbi tui servo tuo ("Remember thy promise unto thy servant"), was, according to Heinrich Glarean writing in the Dodecachordon of 1547, composed as a gentle reminder to the king to keep his promise of a benefice to Josquin, which he had forgotten to keep. According to Glarean's story, it worked: the court applauded, and the king gave Josquin his benefice. Upon receiving it, Josquin reportedly wrote a motet on the text Benefecisti servo tuo, Domine ("Lord, thou hast dealt graciously with thy servant") to show his gratitude to the king. Ercole I d'Este was an important patron of the arts during the Italian Renaissance; he was Josquin's employer in 1503 and 1504. Josquin probably remained in the service of Louis XII until 1503, when Duke Ercole I of Ferrara hired him for the chapel there. One of the rare mentions of Josquin's personality survives from this time. Prior to hiring Josquin, one of Duke Ercole's assistants recommended that he hire Heinrich Isaac instead, since Isaac was easier to get along with, more companionable, was more willing to compose on demand, and would cost significantly less (120 ducats vs. 200). Ercole, however, chose Josquin. While in Ferrara, Josquin wrote some of his most famous compositions, including the austere, Savonarola-influenced Miserere, which became one of the most widely distributed motets of the 16th century; the utterly contrasting, virtuoso motet Virgo salutiferi; and possibly the Missa Hercules Dux Ferrariae, which is written on a cantus firmus derived from the musical letters in the Duke's name, a technique known as soggetto cavato. Josquin did not stay in Ferrara long. An outbreak of the plague in the summer of 1503 prompted the evacuation of the Duke and his family, as well as two-thirds of the citizens, and Josquin left by April of the next year, possibly also to escape the plague. His replacement, Jacob Obrecht, died of the plague in the summer of 1505, to be replaced by Antoine Brumel in 1506, who stayed until the disbanding of the chapel in 1510. Josquin went directly from Ferrara to his home region of Condé-sur-l'Escaut, southeast of Lille on the present-day border between Belgium and France, becoming provost of the collegiate church of Notre-Dame on 3 May 1504, a large musical establishment that he headed for the rest of his life. While the chapter at Bourges Cathedral asked him to become master of the choirboys there in 1508, it is not known how he responded, and there is no record of his having been employed there; most scholars presume he remained in Condé. In 1509, he held concurrently provost and choir master offices at Saint Quentin collegiate church. During the last two decades of his life, Josquin's fame spread abroad along with his music. The newly developed technology of printing made wide dissemination of his music possible, and Josquin was the favorite of the first printers: one of Petrucci's first publications, and the earliest surviving print of music by a single composer, was a book of Josquin's masses which he printed in Venice in 1502. This publication was successful enough that Petrucci published two further volumes of Josquin's masses, in 1504 and 1514, and reissued them several times. On his death-bed, Josquin asked that he be listed on the rolls as a foreigner, so that his property would not pass to the Lords and Ladies of Condé. This bit of evidence has been used to show that he was French by birth. Additionally, he left an endowment for the performance of his late motet, Pater noster, at all general processions in the town when they passed in front of his house, stopping to place a wafer on the marketplace altar to the Holy Virgin. Pater noster may have been his last work. Josquin lived during a transitional stage in music history. Musical styles were changing rapidly, in part owing to the movement of musicians between different regions of Europe. Many northern musicians moved to Italy, the heart of the Renaissance, attracted by the Italian nobility's patronage of the arts; while in Italy, these composers were influenced by the native Italian styles, and often brought those ideas with them back to their homelands. The sinuous musical lines of the Ockeghem generation, the contrapuntal complexity of the Netherlanders, and the homophonic textures of the Italian lauda and secular music began to merge into a unified style; indeed Josquin was to be the leading figure in this musical process, which eventually resulted in the formation of an international musical language, of which the most famous composers included Palestrina and Lassus. Josquin likely learned his craft in his home region in the North, in France, and then in Italy when he went to Milan and Rome. His early sacred works emulate the contrapuntal complexity and ornamented, melismatic lines of Ockeghem and his contemporaries, but at the same time he was learning his contrapuntal technique he was acquiring an Italianate idiom for his secular music: after all, he was surrounded by Italian popular music in Milan. By the end of his long creative career, which spanned approximately 50 productive years, he had developed a simplified style in which each voice of a polyphonic composition exhibited free and smooth motion, and close attention was paid to clear setting of text as well as clear alignment of text with musical motifs. While other composers were influential on the development of Josquin's style, especially in the late 15th century, he himself became the most influential composer in Europe, especially after the development of music printing, which was concurrent with the years of his maturity and peak output. This event made his influence even more decisive than it might otherwise have been. Many "modern" musical compositional practices were being born in the era around 1500. Josquin made extensive use of "motivic cells" in his compositions, short, easily recognizable melodic fragments which passed from voice to voice in a contrapuntal texture, giving it an inner unity. This is a basic organizational principle in music which has been practiced continuously from approximately 1500 until the present day. Josquin wrote in all of the important forms current at the time, including masses, motets, chansons, and frottole. He even contributed to the development of a new form, the motet-chanson, of which he left at least three examples. In addition, some of his pieces were probably intended for instrumental performance. Each area of his output can be further subdivided by form or by hypothetical period of composition. Since dating Josquin's compositions is particularly problematic, with scholarly consensus only achieved on a minority of works, discussion here is by type. Manuscript showing the opening Kyrie of the Missa de Beata Virgine, a late work. Rome, Biblioteca Apostolica Vaticana, Capp. Sist. 45, ff. 1v-2r. Josquin wrote towards the end of the period in which the mass was the predominant form of sacred composition in Europe. The mass, as it had developed through the 15th century, was a long, multi-section form, with opportunities for large-scale structure and organization not possible in the other forms such as the motet. Josquin wrote some of the most famous examples of the genre, most using some kind of cyclic organization. soggetto cavato, or solmization mass, in which the tune is drawn from the syllables of a name or phrase (for example "la sol fa re mi"—A, G, F, D, E—based on the syllables of Lascia fare mi ("let me do it", a phrase used by an unknown patron, in a context around which much legend has arisen). canon, in which an entire mass is based on canonic techniques, and no pre-existing material has been identified. Most of these techniques, particularly paraphrase and parody, became standardized during the first half of the 16th century; Josquin was very much a pioneer, and what was perceived by later observers as the mixing of these techniques was actually the process by which they were created. Prior to Josquin's mature period, the most common technique for writing masses was the cantus firmus, a technique which had been in use already for most of the 15th century. It was the technique that Josquin used earliest in his career, with the Missa L'ami Baudichon, possibly his first mass. This mass is based on a secular—indeed ribald—tune similar to "Three Blind Mice". That basing a mass on such a source was an accepted procedure is evident from the existence of the mass in Sistine Chapel part-books copied during the papacy of Julius II (1503 to 1513). Josquin's most famous cantus-firmus masses are the two based on the L'homme armé tune, which was the favorite tune for mass composition of the entire Renaissance. The earlier of the two, Missa L'homme armé super voces musicales, is a technical tour-de-force on the tune, containing numerous mensuration canons and contrapuntal display. It was by far the most famous of all his masses. The second, Missa L'homme armé sexti toni, is a "fantasia on the theme of the armed man." While based on a cantus firmus, it is also a paraphrase mass, for fragments of the tune appear in all voices. Technically it is almost restrained, compared to the other L'homme armé mass, until the closing Agnus Dei, which contains a complex canonic structure including a rare retrograde canon, around which other voices are woven. The paraphrase technique differs from the cantus-firmus technique in that the source material, though it still consists of a monophonic original, is embellished, often with ornaments. As in the cantus-firmus technique, the source tune may appear in many voices of the mass. Several of Josquin's masses feature the paraphrase technique, and they include some of his most famous work including the great Missa Gaudeamus. The relatively early Missa Ave maris stella, which probably dates from his years in the Sistine Chapel choir, paraphrases the Marian antiphon of the same name; it is also one of his shortest masses. The late Missa de Beata Virgine paraphrases plainchants in praise of the Virgin Mary; it is a Lady Mass, a votive mass for Saturday performance, and was his most popular mass in the 16th century. By far the most famous of Josquin's masses using the technique, and one of the most famous mass settings of the entire era, was the Missa pange lingua, based on the hymn by Thomas Aquinas for the Vespers of Corpus Christi. It was probably the last mass that Josquin composed. This mass is an extended fantasia on the tune, using the melody in all voices and in all parts of the mass, in elaborate and ever-changing polyphony. One of the high points of the mass is the et incarnatus est section of the Credo, where the texture becomes homophonic, and the tune appears in the topmost voice; here the portion which would normally set "Sing, O my tongue, of the mystery of the divine body" is instead given the words "And he became incarnate by the Holy Ghost from the Virgin Mary, and was made man." In parody masses, the source material was not a single line, but an entire texture, often of a popular song. Several works by Josquin fall loosely into this category, including the Missa Fortuna desperata, based on the three-voice song Fortuna desperata (possibly by Antoine Busnois); the Missa Malheur me bat (based on a chanson variously ascribed to Obrecht, Ockeghem, or, most likely, Abertijne Malcourt); and the Missa Mater Patris, based on a three-voice motet by Antoine Brumel. The Missa Mater Patris is probably the first true parody mass to be composed, for it no longer contains any hint of a cantus firmus. Parody technique was to become the most usual means of mass composition for the remainder of the 16th century, although the mass gradually fell out of favor as the motet grew in esteem. The earliest known mass by any composer using this method of composition—the soggetto cavato—is the Missa Hercules Dux Ferrariae, which Josquin probably wrote in the early 1480s for the powerful Ercole I, Duke of Ferrara. The notes of the cantus firmus are drawn from the musical syllables of the Duke's name in the following way: Ercole, Duke of Ferrara in Latin is Hercules Dux Ferrarie. Taking the solmization syllables with the same vowels gives: Re–Ut–Re–Ut–Re–Fa–Mi–Re (in modern nomenclature: D–C–D–C–D–F–E–D). Another mass using this technique is the Missa La sol fa re mi, based on the musical syllables contained in "Lascia fare mi" ("let me do it"). The story, as told by Glareanus in 1547, was that an unknown aristocrat used to order suitors away with this phrase, and Josquin immediately wrote an "exceedingly elegant" mass on it as a jab at him. Canonic masses came into increasing prominence in the latter part of the 15th century. Early examples include Ockeghem's famous Missa prolationum, consisting entirely of mensuration canons, the Missa L'homme armé of Guillaume Faugues, whose cantus firmus is presented in canon at the descending fifth, the Missa [Ad fugam] of Marbrianus de Orto, based on freely composed canons at the fifth between superius and tenor, and the two great canonic masses of Josquin, the Missa Ad fugam and Missa Sine nomine. Josquin makes use of canon in the Osanna and Agnus Dei III of the Missa L'homme armé sexti toni, throughout the Missa Sine nomine and Missa Ad fugam, and in the final three movements of the Missa De beata virgine. The Missa L'homme armé super voces musicales incorporates mensuration canons in the Kyrie, Benedictus, and Agnus Dei II. Josquin's motet style varied from almost strictly homophonic settings with block chords and syllabic text declamation to highly ornate contrapuntal fantasias, to the psalm settings which combined these extremes with the addition of rhetorical figures and text-painting that foreshadowed the later development of the madrigal. He wrote many of his motets for four voices, an ensemble size which had become the compositional norm around 1500, and he was also a considerable innovator in writing motets for five and six voices. No motets of more than six voices have been reliably attributed to Josquin. Almost all of Josquin's motets use some kind of compositional constraint on the process; they are not freely composed. Some of them use a cantus firmus as a unifying device; some are canonic; some use a motto which repeats throughout; some use several of these methods. The motets that use canon can be roughly divided into two groups: those in which the canon is plainly designed to be heard and appreciated as such, and another group in which a canon is present, but almost impossible to hear, and seemingly written to be appreciated by the eye, and by connoisseurs. Josquin frequently used imitation, especially paired imitation, in writing his motets, with sections akin to fugal expositions occurring on successive lines of the text he was setting. An example is his setting of Dominus regnavit (Psalm 93), for four voices; each of the lines of the psalm begins with a voice singing a new tune alone, quickly followed by entries of other three voices in imitation. In writing polyphonic settings of psalms, Josquin was a pioneer, and psalm settings form a large proportion of the motets of his later years. Few composers prior to Josquin had written polyphonic psalm settings. Some of Josquin's settings include the famous Miserere, written in Ferrara in 1503 or 1504 and most likely inspired by the recent execution of the reformist monk Girolamo Savonarola, Memor esto verbi tui, based on Psalm 119, and two settings of De profundis (Psalm 130), both of which are often considered to be among his most significant accomplishments. 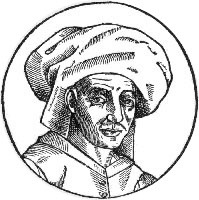 In the domain of secular music, Josquin left numerous French chansons, for from three to six voices, as well as a handful of Italian secular songs known as frottole, as well as some pieces which were probably intended for instrumental performance. Problems of attribution are even more acute with the chansons than they are with other portions of his output: while about 70 three and four-voice chansons were published under his name during his lifetime, only six of the more than thirty five- and six-voice chansons attributed to him were circulated under his name during the same time. Many of the attributions added after his death are considered to be unreliable, and much work has been done in the last decades of the 20th century to correct attributions on stylistic grounds. Josquin's earliest chansons were probably composed in northern Europe, under the influence of composers such as Ockeghem and Busnois. Unlike them, however, he never adhered strictly to the conventions of the formes fixes—the rigid and complex repetition patterns of the rondeau, virelai, and ballade—instead he often wrote his early chansons in strict imitation, a feature they shared with many of his sacred works. He was one of the first composers of chansons to make all voices equal parts of the texture; and many of his chansons contain points of imitation, in the manner of motets. However he did use melodic repetition, especially where the lines of text rhymed, and many of his chansons had a lighter texture, as well as a faster tempo, than his motets. Inside of his chansons, he often used a cantus firmus, sometimes a popular song whose origin can no longer be traced, as in Si j'avoye Marion. Other times he used a tune originally associated with a separate text; and still other times he freely composed an entire song, using no apparent external source material. Another technique he sometimes used was to take a popular song and write it as a canon with itself, in two inner voices, and write new melodic material above and around it, to a new text: he used this technique in one of his most famous chansons, Faulte d'argent ("The problem with money"), a song sung by a man who wakes in bed with a prostitute, broke and unable to pay her. Some of his chansons were doubtless designed to be performed instrumentally. That Petrucci published many of them without text is strong evidence of this; additionally, some of the pieces (for example, the fanfare-like Vive le roy) contain writing more idiomatic for instruments than voices. Josquin's most famous chansons circulated widely in Europe. Some of the better known include his lament on the death of Ockeghem, Nymphes des bois/Requiem aeternam; Mille regretz (the attribution of which has recently been questioned); Plus nulz regretz; and Je me complains. In addition to his French chansons, he wrote at least three pieces in the manner of the Italian frottola, a popular Italian song form which he would have encountered during his years in Milan. These songs include Scaramella, El grillo, and In te domine speravi. They are even simpler in texture than his French chansons, being almost uniformly syllabic and homophonic, and they remain among the most frequently sung portions of his output. While in Milan, Josquin wrote several examples of a new type of piece developed by the composers there, the motet-chanson. These compositions were texturally very similar to 15th century chansons in the formes fixes mold, except that unlike those completely secular works, they contained a chant-derived Latin cantus-firmus in the lowest of the three voices. The other voices, in French, sang a secular text which had either a symbolic relationship to the sacred Latin text, or commented on it. Josquin's three known motet-chansons, Que vous madame/In pace, A la mort/Monstra te esse matrem, and Fortune destrange plummaige/Pauper sum ego, are similar stylistically to those by the other composers of the Milan chapel, such as Loyset Compère and Alexander Agricola. Josquin's fame lasted throughout the 16th century, and indeed increased for several decades after his death. Zarlino, writing in the 1580s, was still using examples from Josquin in his treatises on composition; and Josquin's fame was only eclipsed after the beginning of the Baroque era, with the decline of the pre-tonal polyphonic style. During the 18th and 19th centuries Josquin's fame was overshadowed by later Roman School composer Palestrina, whose music was seen as the summit of polyphonic refinement, and codified into a system of composition by theorists such as Johann Fux; however, during the 20th century, Josquin's reputation has grown steadily, to the point where scholars again consider him "the greatest and most successful composer of the age." According to Richard Sherr, writing in the introduction to the Josquin Companion, addressing specifically the shrinking of Josquin's canon due to correction of misattributions, "Josquin will survive because his best music really is as magnificent as everybody has always said it was." Since the 1950s Josquin's reputation has been boosted by the increasing availability of recordings, of which there are many, and the rise of ensembles specializing in the performance of 16th century vocal music, many of which place Josquin's output at the heart of their repertoire. The difficulties in compiling a works list for Josquin cannot be overstated. Because of his immense prestige in the early sixteenth century, many scribes and publishers did not resist the temptation of attributing anonymous or otherwise spurious works to Josquin. The German editor Georg Forster summed up the situation admirably in 1540 when he wrote, "I remember a certain eminent man saying that, now that Josquin is dead, he is putting out more works than when he was alive." Thus, the authenticity of many of the works listed below is disputed on stylistic grounds or problems with sources or both. This thorny issue has been taken up vigorously in the now nearly complete New Josquin Edition (NJE). ^ Macey et al., §8. ^ "Des Préz, Josquin". Encyclopaedia Britannica. Cambridge: the University Press. 1911. ^ Glareanus, quoted in Sherr, p. 3. ^ a b Sherr, p. 10. ^ Matthews and Merkley, pp. 208–209. ^ a b Macey et al., §1. ^ a b c d e Macey et al. ^ David W. Barber, If It Ain't Baroque: More Music History as It Ought to Be Taught (Toronto: Sound and Vision, 1992), p. 34. ^ a b Sherr, p. 16. ^ Boorman, Stanley. "Petrucci, Ottaviano (dei)." Music Printing and Publishing. New York: Norton, 1990, pp. 365–369. ^ Irving Godt, JMT, 264–292. ^ Blackburn, Planchart, Bloxham, Sherr, in Sherr, 51–248. ^ Planchart, in Sherr, p. 109. ^ Planchart, in Sherr, pp. 130, 132. ^ Planchart, in Sherr, p. 142. ^ A canon from the Agnus Dei II from the Missa L'homme armé super voces musicales is written in a triangular form in Dosso Dossi's Allegory of Music. See the entry Eye music. ^ Brown, Grove (1980), "Chanson." ^ David Fallows, in Sherr, p. 575. Atlas, Allan W., ed. Renaissance Music: Music in Western Europe, 1400–1600. New York: Norton, 1998. ISBN 0-393-97169-4. Blackburn, Bonnie J. "Masses Based on Popular Songs and Solmization Syllables". The Josquin Companion, edited by Richard Sherr, 51–88. Oxford and New York: Oxford University Press, 2000. ISBN 0-19-816335-5. Charles, Sydney R. Josquin des Prez: A Guide to Research. New York and London: Garland Publishing, Inc., 1983. Clutterham, Leslie. "Dating Josquin's Enigmatic Motet Illibata Dei virgo nutrix". Choral Journal 38, no. 3 (October 1997): 9–14. Online version as "Auobiographical [sic] Constructions in Josquin's Motet Illibata Dei virgo nutrix: Evidence for a Later Dating" (Accessed 8 May 2012). Duffin, Ross W., ed. A Josquin Anthology. Oxford University Press, 1999. ISBN 0-19-353218-2. Elders, Willem, ed. New Josquin Edition, 30 vols. Utrecht: Koninklijke Vereniging voor Nederlandse Muziekgeschiedenis, 1987– . ISBN 978-90-6375-051-0. Elders, Willem, and Frits de Haen, eds. Proceedings of the International Josquin Symposium, Utrecht 1986 . Utrecht: Vereniging voor Nederlandse Muziekgeschiedenis, 1986. ISBN 90-6375-148-6. Elders, Willem, For a complete list of publications by Josquin specialist Willem Elders, please visit his website: willemelders.eu. Fallows, David. Josquin. Turnhout: Brepols Publishers, 2009, ISBN 978-2-503-53065-9. Fiore, Carlo. Josquin des Prez. L'Epos: Palermo, 2003, ISBN 978-8883022203. Godt, Irving. "Motivic Integration in Josquin's Motets." Journal of Music Theory, 21, 2 (Autumn, 1977): 264–292. Higgins, Paula. "The Apotheosis of Josquin des Prez and Other Mythologies of Musical Genius". Journal of the American Musicological Society, 57, 3 (Autumn, 2004): 443–510. Lowinsky, Edward E., ed. Josquin des Prez. London: Oxford University Press, 1976. Macey, Patrick. Bonfire Songs: Savonarola's Musical Legacy. Oxford: Clarendon Press. 1998. ISBN 0-19-816669-9. Merkley, Paul. "Josquin Desprez in Ferrara". The Journal of Musicology 18, 4 (2001): 544–583. Milsom, John. "Motets for Five or More Voices". In The Josquin Companion, edited by Richard Sherr, 281–320. Oxford and New York: Oxford University Press, 2000. ISBN 0-19-816335-5. Reese, Gustave. Music in the Renaissance. New York: W.W. Norton, 1954. ISBN 0-393-09530-4. Reese, Gustave, Jeremy Noble, Lewis Lockwood, Jessie Ann Owens, James Haar, Joseph Kerman, and Robert Stevenson. The new Grove High Renaissance Masters: Josquin, Palestrina, Lassus, Byrd, Victoria. The Composer Biography Series; The New Grove Dictionary of Music and Musicians. London: Macmillan Publishers, 1980–84. ISBN 0-393-30093-5. Sherr, Richard, ed. The Josquin Companion. Oxford: Oxford University Press, 2000. ISBN 0-19-816335-5. Steib, Murray. "A Study in Style, or Josquin or Not Josquin: The Missa Allez regretz Question". The Journal of Musicology 16, 4 (Autumn, 1998): 519–544. Taruskin, Richard. Music from the Earliest Notations to the Sixteenth Century. The Oxford History of Western Music, Volume 1. New York: Oxford University Press, 2010. ISBN 978-0-19-538481-9. Wegman, Rob C. "Who Was Josquin?" In The Josquin Companion, edited by Richard Sherr, 21–50. Oxford and New York: Oxford University Press, 2000. ISBN 0-19-816335-5. Herbermann, Charles, ed. (1913). "Josquin Deprés" . Catholic Encyclopedia. New York: Robert Appleton Company. Listen to free recordings of compositions from Umeå Akademiska Kör. Adieu mes amours was a popular secular polyphonic chanson of the late 15th century. Many settings of this tune are in fact based on the c. 1480 setting by Josquin des Prez, in which the lower two voices are in quasi-canon, and the upper two voices are freer. The tune itself is in a simple ABA' form. It appeared in many manuscripts and prints from many countries, including in Ottaviano Petrucci's Odhecaton A. "Ave Maria ... Virgo serena" is a motet composed by Josquin des Prez. It is regarded as Josquin's most famous motet and one of the most famous pieces of the 15th century. The piece rose to extreme popularity in the 16th century, even appearing at the head of the first volume of motets ever printed. Its revolutionary open style featuring early imitative counterpoint and two-voice parts has added to its acclaim as one of the most influential compositions of its time. Despréz is a crater on Mercury with a diameter of 47.05 kilometers. Its name was adopted by the International Astronomical Union (IAU) in 1979. Despréz is named for the French composer Josquin des Prez, who lived from 1440 to 1521. Jean Richafort (c. 1480 – c. 1547) was a Netherlandish composer of the Renaissance. He was probably born in Hainaut, and his native language appears to have been French. According to the poet Ronsard, Richafort studied with Josquin des Prez, an association further born out by the fact that he composed a requiem "in memoriam Josquin Desprez". Richafort served as choir master at St. Rumbold's Cathedral in Mechelen between 1507 and 1509, and at St. Giles’ church in Bruges between 1542 and 1547—leaving a huge gap in the record of his activity. At some time between these dates he was associated with the French royal chapel, since some of his music is for official occasions connected with Louis XII, and there is some evidence he may have been in Brussels in 1531 in the service of Queen Mary of Hungary, who was regent there. Musically, Richafort was a representative of the first generation after Josquin, and he followed his style in many ways. In some of his music he used fragments of Josquin's compositions as a tribute. Richafort's compositional techniques are typical of the period (smooth polyphony pervasive imitation, etc.) but he was unusually attentive to the clear setting of text so the words could be understood. He wrote a requiem for six voices (Requiem in memoriam Josquin des Prez, 1532), masses, motets, settings of the Magnificat, two secular motets, and chansons. Martin Luther was a great enthusiast for music, and this is why it forms a large part of Lutheran services; in particular, Luther admired the composers Josquin des Prez and Ludwig Senfl and wanted singing in the church to move away from the ars perfecta (Catholic Sacred Music of the late Renaissance) and towards singing as a Gemeinschaft (community). Lutheran hymns are sometimes known as chorales. Lutheran hymnody is well known for its doctrinal, didactic, and musical richness. Most Lutheran churches are active musically with choirs, handbell choirs, children's choirs, and occasionally change ringing groups that ring bells in a bell tower. Johann Sebastian Bach, a devout Lutheran, composed music for the Lutheran church: more than half of his over 1000 compositions are or contain Lutheran hymns. The authorship of the original as by Josquin is sometimes disputed.The chanson was said to be a favorite of King Charles I of Spain. The Miserere, by Josquin des Prez, is a motet setting of Psalm 51 (Psalm 50 in the Septuagint numbering) for five voices. He composed it while in the employ of Duke Ercole I d'Este in Ferrara, in 1503 or 1504. It was one of the most famous settings of that psalm of the entire Renaissance, was hugely influential in subsequent settings of the Penitential Psalms, and was itself probably inspired by the recent suffering and execution of the reformer Girolamo Savonarola.During the 1490s, the Duke of Ferrara, Ercole I d'Este, kept in close contact with Savonarola, who was also from Ferrara, and supported him in his efforts to reform the Roman Catholic Church. About a dozen letters between the two survive: the Duke sought advice both on spiritual and political matters (for example, his alliance with France). Even after Savonarola's arrest, Duke Ercole attempted to have him freed, but his last letter to the church authorities in Florence, in April 1498, went unanswered. After Savonarola's execution, Ercole, then in his eighties, probably commissioned his newly hired composer, Josquin, to write him a musical testament, very likely for performance during Holy Week of 1504. Savonarola's impassioned meditation on sin and repentance, Infelix ego, composed in prison after his torture, and published in Ferrara in mid-1498 shortly after his death, was the probable model for Josquin's setting. It is an extended prayer to the God against whom he believes he has sinned, based closely on Psalm 51, and unified by a boldface-type repetition of the phrase "Miserere mei, Deus" throughout the text. In keeping with Savonarola's dislike of polyphony and musical display, the Miserere is written in a spare, austere style, much different from the contrapuntal complexity, virtuosity, and ornamentation of works such as the five-part motet Virgo salutiferi, which was probably written around the same time. The tenor part, which contains the repeating phrase "Miserere mei, Deus", was likely written to be sung by the Duke himself, who was a trained musician and often sang with the musicians in his chapel.The Miserere is one of Josquin's two "motto" motets, motets in which repetitions of a phrase are the predominant structural feature (the other is the five-voice Salve Regina of several years before). In the Miserere, the opening words of the first verse "Miserere mei, Deus", sung to a simple repeated-note motif containing only two pitches (E and F), serves as the motto. This recurs after each of the 19 verses of the psalm. The motto theme begins each time on a different pitch, with the recurrences moving stepwise down the scale from E above middle C to the E an octave below, then back up again to the opening E, and then down stepwise to A fifth below, where the piece ends. In addition, the length of the motto theme is halved once it begins its ascent out of the bass, and has its length returned to normal for the final descent from E to A. These three journeys of the motto theme's opening note, down, up, and then down again, define the three divisions of the composition: a brief break is usually observed in performance between them. While overall the composition is in the Phrygian mode, the harmonized repetitions enforce tonal variety. Texturally, the piece is so constructed that the words are always clearly intelligible. Intelligibility of sung text was not always a high priority for composers of the period, and this lack of intelligibility was a specific criticism Savonarola made of polyphonic music. Josquin arranges for the words to be heard by using chordal textures, duets, and by avoiding dense polyphony; and of course after each verse the tenor voice intones alone "Miserere mei, Deus", as in the Savonarola meditation. As tenor sings these words, the other voices join in one at a time to reinforce the first, "an effect analogous to boldface type in a printed text. "Josquin's setting of the Miserere was influential not only as a psalm setting, but as an example of how to approach the text of Infelix ego. Later in the 16th century, composers who specifically set the words of Savonarola, such as Adrian Willaert, Cipriano de Rore, and Nicola Vicentino, all of whom wrote motets on Infelix ego, used Josquin's work as a model. The Missa Di dadi, also known as the Dice Mass or Missa N'aray je jamais mieulx, is a musical setting of the Ordinary of the Mass by Franco-Flemish composer Josquin des Prez, probably dating from around 1480. It uses the chanson N'aray je jamais mieulx by Robert Morton as the source of its cantus firmus, and also contains unique visual and musical references to dice. The latter is thought to be a reference to the popularity of gambling in the court of the Sforza family at Milan, where Josquin wrote it. The Missa Gaudeamus is a musical setting of the Ordinary of the Mass by Franco-Flemish composer Josquin des Prez, probably composed in the early or middle 1480s, and published in 1502. It is based on the gregorian introit Gaudeamus Omnes and its setting is for four voices. The Missa Hercules dux Ferrariae is a setting of the Ordinary of the Mass composed by Josquin des Prez, and dedicated to Ercole d'Este I, Duke of Ferrara. The musical source material for the mass, the cantus firmus, is derived from the musical letters in the Duke's name, a technique called soggetto cavato. Over 40 settings of the Ordinary of the Mass using the tune L'homme armé survive from the period between 1450 and the end of the 17th century, making the tune the most popular single source from the period on which to base an imitation mass. Missa L'homme armé sexti toni is probably the later of two L'homme arme masses by Josquin des Prez. "sexti toni" refers to the use of the sixth mode. The theme is shared between all voices rather than being confined to the tenor, as in Josquin's earlier L'homme armé mass (Missa L'homme armé super voces musicales). The five sections of the mass contain several examples of compositional virtuosity, including strict canons in the Sanctus/Osanna and simultaneous statements of the theme both forwards and in retrograde in the final Agnus Dei. The Missa L'homme armé super voces musicales is the first of two settings of the Ordinary of the Mass by Josquin des Prez using the famous L'homme armé tune as their cantus firmus source material (for the other, presumed later, setting see Missa L'homme armé sexti toni). The setting is for four voices. It was the most famous mass Josquin composed, surviving in numerous manuscripts and print editions. The earliest printed collection of music devoted to a single composer, the Misse Josquin published by Ottaviano Petrucci in 1502, begins with this famous work. The Missa La sol fa re mi is a musical setting of the mass by Josquin des Prez, first published in 1502. It is one of his most famous masses, and one of the earliest and most renowned examples of the soggetto cavato technique – the technique of deriving musical notes from the syllables of a phrase, in this case "Lascia fare mi" (Italian: "leave me alone"). The Missa Pange lingua is a musical setting of the Ordinary of the Mass by Franco-Flemish composer Josquin des Prez, probably dating from around 1515, near the end of his life. Most likely his last mass, it is an extended fantasia on the Pange Lingua hymn, and is one of Josquin's most famous mass settings. A Missa sine nomine, literally a "Mass without a name", is a musical setting of the Ordinary of the Mass, usually from the Renaissance, which uses no pre-existing musical source material, as was normally the case in mass composition. Not all masses based on freely composed material were so named, but many were, particularly from the late 15th century through the 16th century. One of the earliest examples of a Missa sine nomine is by Guillaume Dufay, (Bologna, International museum and library of music, Ms Q15) whose Missa Resvelliés vous (formerly known as a Missa sine nomine) dates from before 1430, and possibly as early as 1420. It may have been written for the wedding of Carlo Malatesta and Vittoria di Lorenzo in Rimini.Many other composers wrote Missae sine nomine, including Walter Frye, Barbingant, Alexander Agricola, Johannes Tinctoris, Matthaeus Pipelare, Heinrich Isaac, Pierre de La Rue, Josquin des Prez, Jean Mouton, Vincenzo Ruffo, and others. Some masses sine nomine, i.e. based on freely-composed material, were actually named in other ways: the most famous is Giovanni Pierluigi da Palestrina's Missa Papae Marcelli, the Pope Marcellus Mass, which according to a somewhat exaggerated legend persuaded the Council of Trent not to ban polyphonic writing in liturgical music. Also many canonic masses are literally sine nomine: the Missa prolationum of Johannes Ockeghem and the Missa ad fugam of Josquin des Prez are of this type, as is the late Missa sine nomine by Josquin, in which he returns with new insight to compositional problems he first tackled in his early Missa Ad fugam. A myth dating from the time of the Council of Trent was that a Missa sine nomine hid a secular tune, and the listeners were expected to "get the joke"; however the practice of writing masses on freely-composed material predated the Council of Trent and the Counter-Reformation. Agnus DeiThe melodic material on which the mass is based, "Sine nomine" (without a name), is either freely composed or from a source which has not been identified. All voices take part in the numerous canons, and the texture is often fully imitative. The movements generally become fuller in texture with faster note values as they progress, giving each a dramatic curve, and several end with ostinato patterns.The work is likely a tribute to Johannes Ockeghem, who may have been Josquin's teacher or mentor, according to the testimony of several 16th century writers as well as internal evidence in many of Josquin's compositions. Not only is the mass indebted to Ockeghem through its use of elaborate canonic techniques, its modal ambiguity, and its avoidance of head-motifs to unify sections, but it directly quotes the lament Josquin wrote on Ockeghem's death – Nymphes des bois – in the et incarnatus section of the Credo, a part of the mass that Josquin often reserved for his most striking textural contrasts or effects.The unconstrained compositional methods that Josquin employed in writing this mass foreshadowed what was probably his next work, the Missa Pange lingua, which was an extended fantasy on a plainsong, and which was probably his last mass. Nymphes des bois, also known as La Déploration de Johannes Ockeghem, is a lament composed by Josquin des Prez on the occasion of the death of his predecessor Johannes Ockeghem in February 1497. The piece, based on a poem by Jean Molinet and including the funeral text Requiem Aeternam as a cantus firmus, is in five voices. In the first of its two parts Josquin cleverly mimics the contrapuntal style of Ockeghem. This chanson is one of Josquin's best-known works, and often considered one of the most haunting and moving memorial works ever penned.